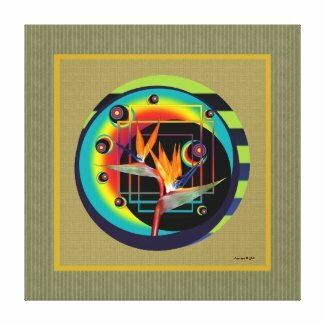 Digital collage of twin headed bird of paradise flower inside an vibrant orb on textured background. I placed this photo inside this colorful orb to represent the energy of flowers. This flower bloomed in my neighbors front garden on the same day my cat Trent passed away. This was the first twin head flower this strelitzia plant had ever bloomed. My friend suggested this was a message from my cat Trent.